Meet The New Mom Doulas! 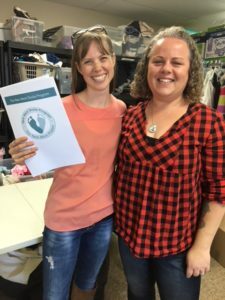 Meet Kate and Leah the New Coordination Team for the New Mom Doula Program. We are proud to offer their doula expertise to you! Kate is a mom to twins, an experienced doula and previous educator abroad. Being a new mom has recently brought Leah to the doula world. She has had a long career as a social worker supporting at risk and homeless youth. Our goal is to help new moms (first time birth) in Canada to navigate the Canadian healthcare system. When you are in a new country it can be tough, and having a new baby can be challenging. So, we want to help and support you. Do you know what doulas are? As a newcomer in Canada, a doula can be a support person to help you navigate through your pregnancy. We care and our doulas want to give back to their communities, and they want to provide their services for free! You do not need to do this alone, our Doulas want to assist you in your first pregnancy. They will provide compassionate, and culturally sensitive pre-natal, post-natal, and birth support care. Throughout your 9 month journey, doulas can provide emotional support, physical support, birth coaching, and birth planning. For more support, doulas can educate moms about baby care, prenatal and postnatal nutrition. All the while, they are connected with the New Mom Project and with the community resources to help you have a healthy and safe pregnancy. There is a new baby on the way! Our doulas visit you prenatally, provide full support during labour, and provide a postnatal check-in. This incredible care will have such a positive impact on your experience becoming a mom in Canada. If you would like to support our great initiative, you can donate to our GoFundMe campaign by clicking here! This service is only available to qualifying mothers. If you are interested in our program, contact Gwen at New Mom Project to apply, or speak with you family doctor for a referral.